I have been working with the voice and the throat chakra for many years and I see time and time again within myself and my clients, restriction and blocks around the expression of our voice and speaking our truth. We’re told what to say, how to say it, what not to say, how to sing, or not to sing at all, we’re worried about upsetting others if we say no, or being too much if we say yes. Yikes! We have an incredible amount of programming and beliefs formulated around what is okay to express and say and what is not. God forbid we cry in public, or disagree with a loved one. When that energy isn’t expressed out of the body, where do you think it goes? Our throat chakras are blocked and unexplored. Who's biggest fear is public speaking and singing in front of others? Where do you think that fear comes from? Are you worried about being seen or heard fully? Getting to the root of these fears is a freeing and compassionate process. Baby steps. Are you holding space for yourself? Are you self- critical or worry about the criticism of others? Do you think what you have to say is of value? What is your soul craving to express? I've had to answer all these questions and work on the beliefs behind my behaviours. Gosh, I would've much rather had written a song saying what I needed to say that actually speak it into the world. I did that for years. It was much easier to agree and suppress my opinion than potentially cause conflict. I was the good girl. Always compliant. I was prone to tonsillitis and throat infections. Putting other people's feelings ahead of mine. I was the BEST listener. People spoke at me and over me because I allowed them to. Singing alone or in a safe environment is a wonderful way to free yourself and heal your throat chakra. As is speaking up for yourself, saying no to things you don't want to do, and not allowing yourself to be spoken over. If you'd like guidance in freeing and exploring your speaking and singing voice I'd love to work with you one on one. In these sessions I intuitively combine meditation, visualisation, singing, reiki, sound healing, breathwork and listening to you tell me your story to support you in uncovering your blocks and taking action. Join me for Morning Song - A singing circle in nature. Something I only really started tapping into about two years ago. I remember reading books on what intuition was, how to find it, follow it. But like anything, it's one thing to understand a concept intellectually, and another thing to really feel and embody what something is. And this takes time.. I was speaking to partner on the phone. He was calling me from Manly on someone elses phone cause he had lost his somewhere that afternoon. I got off the call and knew his phone was at Queenscliff Lagoon. I drove down there and began searching in the dark, and there it was. To date, this is the weirdest intuitive moment I've had. How did I know it was there? I'm not sure, but I just knew. These days my intuition speaks to me in lots of different ways. Through feelings and emotions, picture, smells.. I know now that if I don't trust that initial gut instinct I receive, the energy moves from my sacral up into my head and I can to and frow on the decision till I literally give myself a headache. There are some practices that have helped me forge a deeper connection to my intuition. Practice letting the body answer questions through how it feels. Drop from the mind down into a feeling place within the body. Ask and wait for an answer. Does it feel expansive/ yes, or does it feel like a contractive/no? Explore your human design authority and get to know how you best make decisions. You can find out more about Human Design by getting your chart here, and following Jenna Zoe and listening to any podcasts she's been interviewed on. I had a reading from her last year and it has radically changed the way I move through the world. Using an oracle deck was a game-changer. I love the Keepers of the Light by Kyle Gray and Rebecca Campbell's deck called Work Your Light. Once you've got the hang of it I find The Psychic Tarot Oracle by John Holland very accurate. I will ask, "What energy do I need to embody today?" or "Where am I at today?" or "What guidance do I need today?" - then pull a card and see what feelings, thoughts, stories come up around the card. Trust what comes.. that's your intuition. The Citadel Full Moon Circle is a monthly gathering that has blossomed from a few friends in a lounge room to a community of like-minded, supportive, authentic men and women. The Full Moon is the perfect time to stop, reflect and let go of anything that is no longer serving us. When we tap into the beauty of nature, we remember just how wonderous we are. When we stop and sit, we can see clearly who we truly are. Citadel guides you through a fulfilling evening of mediation, ritual, visualisation, co-creation and chakra sound healing. The circle is held at The Yoga Space, Manly. Tickets must be purchased beforehand so I know how many I'm holding space for. Join the Facebook event or buy your ticket here. Finding my voice has been the most difficult and painful work I have done so far. Bit weird for a singer right!? Give me a stage and a mic and I'll happily sing - but to speak up and communicate what I need has felt terrifying and deeply painful. I'm not alone. So many people I speak with experience these feelings too. Why is it so hard for us to express and communicate? Why do we find it so hard to be SEEN and HEARD? Through the work I've done healing this (and continue to do), and working with others, I have found this blockage to be multi-faceted. For me, it wasn't enough receiving reiki, or humming daily, wearing blue crystals around my neck, visualising myself speaking up in various situations, or going to epic sound baths. All these things were wonderful in healing and unblocking, but if I wasn't speaking my truth and expressing myself in daily life, then I would block right up again. I was treating the symptom and not the cause. The big shifts came when I looked directly at my fear of expression. Why was I creating the block? Why couldn't I speak up? Why were others feeling more important than mine? Why was my opinion not worth being heard? Why did I not want to rock the boat? This work is deep. Complex. Painful. But I have experienced the most amazing feeling of freedom and empowerment since tapping in and digging deep. In my one on one healing sessions we work together to understand your unique picture. We get the energy flowing and moving within your throat chakra, you express what is being held in there and you are guided and supported in day to day life to practice speaking your truth so you feel empowered and worthy. I'm super excited to be bringing this special event to Neutral Bay, Sydney with Power Living Yoga. Tickets are booking out fast, so reserve your spot asap so you don't miss out. I will be working with frequency, song and channelling voice work to assist in balancing your chakras, helping you let go and feel joy and beauty. Carlee is amazing - this one is going to be magical. The next Citadel Full Moon Circle will be on Feb 2nd 2018 at The Yoga Space in Manly. This Full Moon gathering is special because it is going to be a lunar eclipse and a super moon. Click here to reserve your space and read more about the event. See you this Sunday December 3rd at Subsonic Festival. I'll be leading a Full Moon Ceremony and Sound Journey at the Lifestyle Village from 5:45-6:45pm. Expect meditation, letting go and manifesting, receiving sound healing and connection with yourself and other beautiful souls. You've probably heard this term before, but if you're wondering exactly what it means, I've gathered some wisdom from various healers, facilitators and coaches that resonate with me. We practice holding space for each other in our moon circle and we do it everyday when we interact with everyone from friends, family to work mates. It is a beautiful thing to be truly witnessed and something I am working on within myself at the moment. I am practicing not only holding space for others, but holding space for myself and allowing myself to be seen by others. The main one for me is presence. Often in conversation when someone is talking we are thinking about what we can say next, making judgements through our ego or getting distracted thinking about the past or future. Try ACTIVE/MINDFUL listening which is being fully in the moment and listening to all they have to say without interrupting. Don't listen to respond. Listen to understand. Give people permission to trust their own intuition and wisdom. We know ourselves better than anyone else, so let them be lead to the answer within themselves. Keep your own ego out of it. Try not to make comments or tell stories that bring the focus back to you or compare what they are going through to something you have experienced unless it is TRULY helpful. Let go of what WE think they SHOULD be doing, thinking or saying by putting our own judgements and criticisms aside and actually look at them with new eyes and truly see them for who they are, not who we want them to be. Focus on what you can give to others – based on what you’ve ‘heard’ through practicing active listening. Sometimes, all they need is someone to listen and validate what they are feeling. Other times they might need you to show initiative or help in some way, a hug, a question that can lead THEM to an answer. If you're unsure, just ask them what they need from you in that moment. With all of these tips - if you find any particularly challenging, ask yourself why it is difficult for you to do. Do some journaling to flesh it out. When we look and we find the juicy shadowy bits.. that's when things begin to shift. It can be scary as hell to look, but I promise when you're ready and you do, it's worth it. 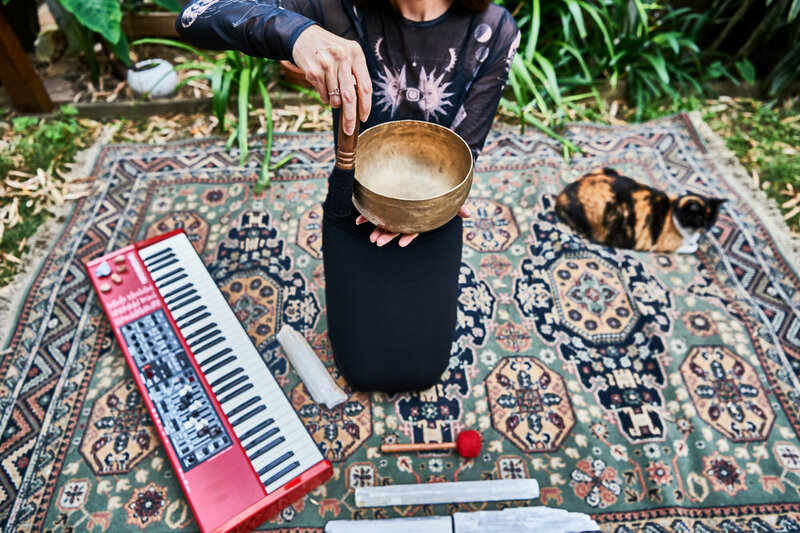 Hello and welcome to my new website, offering information about me and my music and healing, blog posts, upcoming events, music releases and sound healing and meditation recordings. Take a look around and enjoy.